Detroit isn’t just about the automotive industry. It is a city full of history, music, community, art, and rejuvenation. On my latest trip there, I experienced several different things that (after a long couple of stressful months) refueled my inner engine and jump-started my creativity going forward into 2017. For me, Detroit isn’t just about cars and industry, it is a place that I love to travel for inspiration. I’ve said it before, but Detroit is making a comeback as a must see travel destination. During my most recent trip into the city to explore the MotorCity Casino hotel and D.Tour spa, I was delighted to find the nearby streets and businesses bustling with people. New shops had popped up all over the city and restoration projects for older, once forgotten buildings were underway. 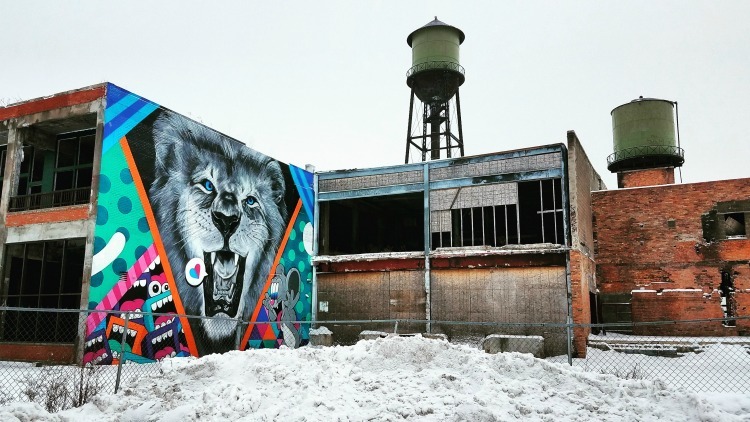 Detroit is a city full of travel potential – for the family looking to explore history and learning, for the couple looking to reconnect, and for the solo traveler looking for inspiration and an opportunity to relax. D.Tour Spa in MotorCity Casino Hotel, Detroit. Photo by Mary Moore / Retro TravelingMom. A recent visit to Detroit came at a time for me when I desperately needed to refuel. I was in the midst of the holiday hustle, work pressure, and struggling through an unfortunate medical diagnosis for one of my children. 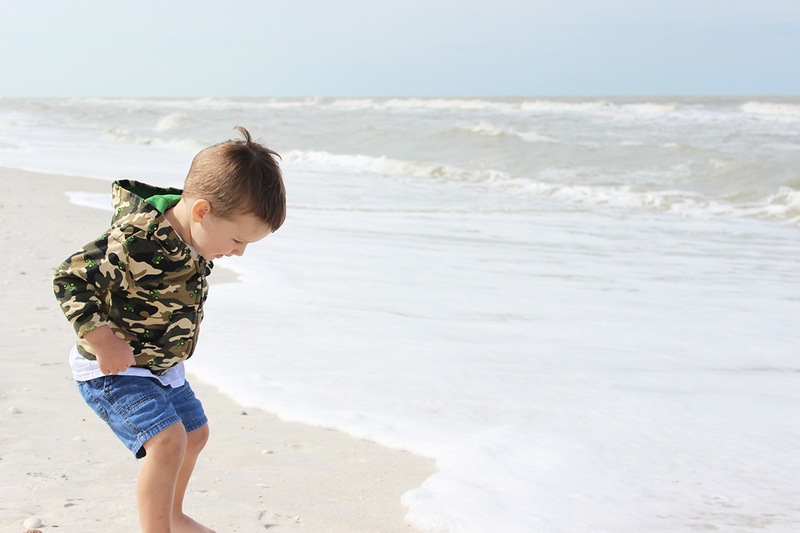 As a mom, it is easy to drain yourself trying to keep up with – well, life. While I normally fail to set time aside for myself, on this occasion I did and I felt so much better because of it. I left this trip feeling more calm, focused, and ready to tackle the obstacles ahead. How did I refuel? 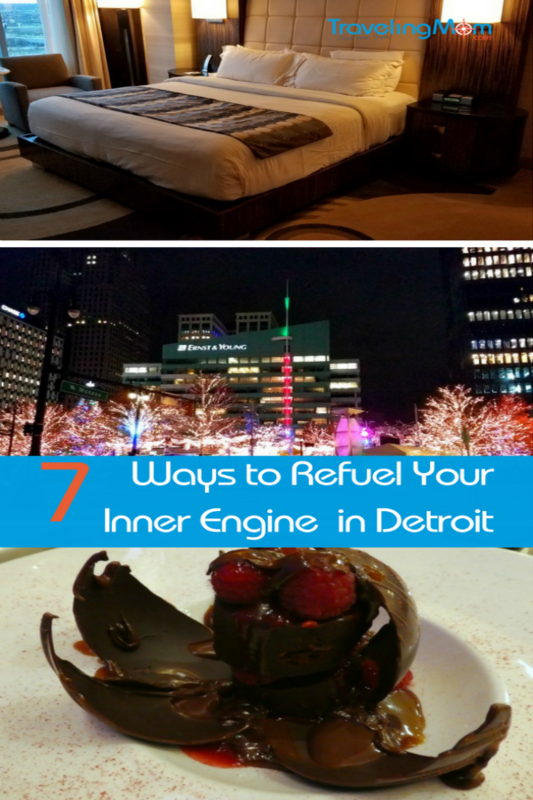 Here are the seven things I did during my 2-day mom-cation in Detroit. Why aren’t spa’s on my to-do list more often? 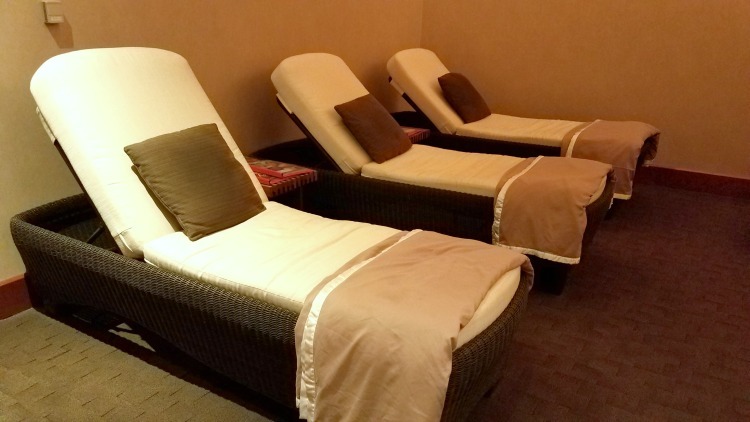 This experience put me in the right mindset for a weekend of relaxation as I melted away during a MotorCity music massage – one of the many themed spa services on the menu at the D.Tour Spa located inside the MotorCity Casino Hotel. I thought it was fun that this spa service included music beats that could be felt within the massage table itself, which uniquely added to the overall experience. Lounging area inside the D.Tour Spa at MotorCity Casino Hotel. 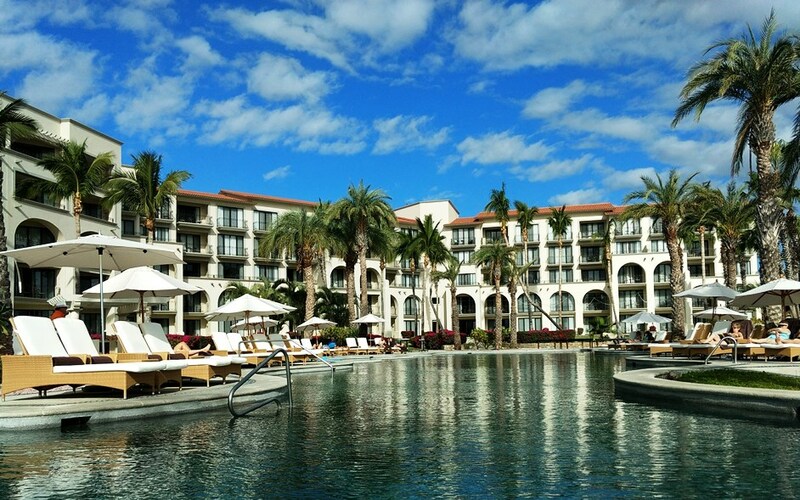 Photo by Mary Moore / Retro TravelingMom. 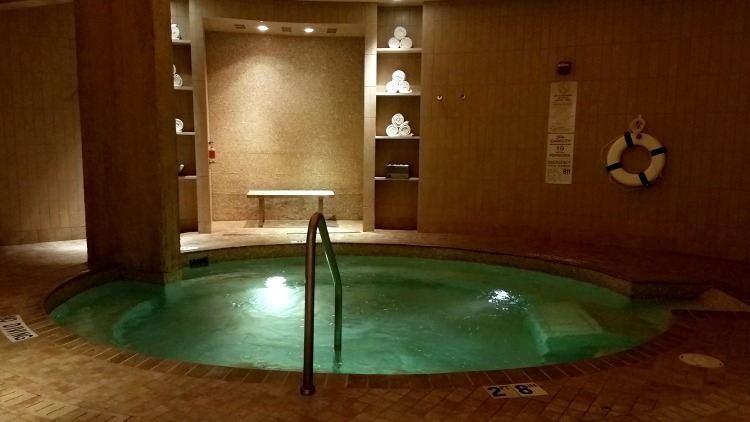 Enjoy chosen spa service at the D.Tour spa and guests are also invited to use the community thermal whirlpool, dry sauna, large steam rooms, and rain shower facilities. More options include lounging areas complete with snacks, lounge chairs, and magazines to read during the day of their spa treatment. 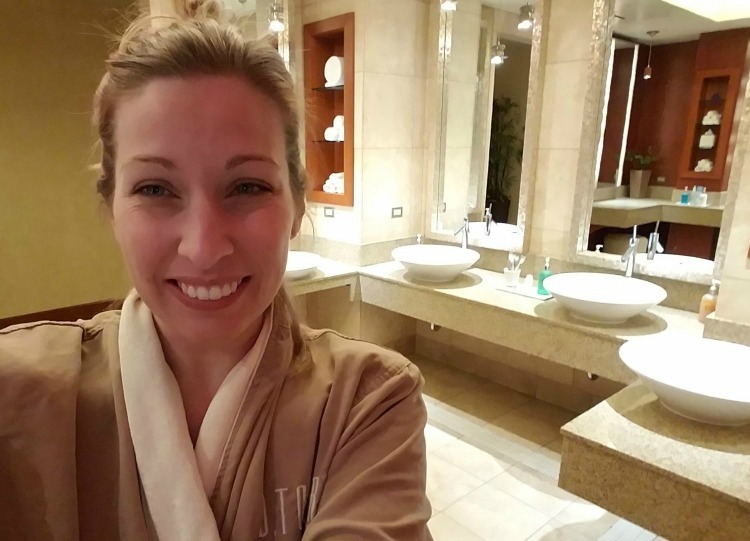 I definitely made the most of my time at this spa by soaking up all of these experiences. Before I left, I was thoughtfully given a behind the scenes tour of this 13,000 square-foot facility. After seeing everything this spa had to offer, I am since inspired to plan another trip to this spa in the near future with my husband. I think he would love to experience the dedicated men’s side of the spa with services geared specifically towards men. They also have couples massage rooms, which include hydrotherapy tubs and side by side massage tables. 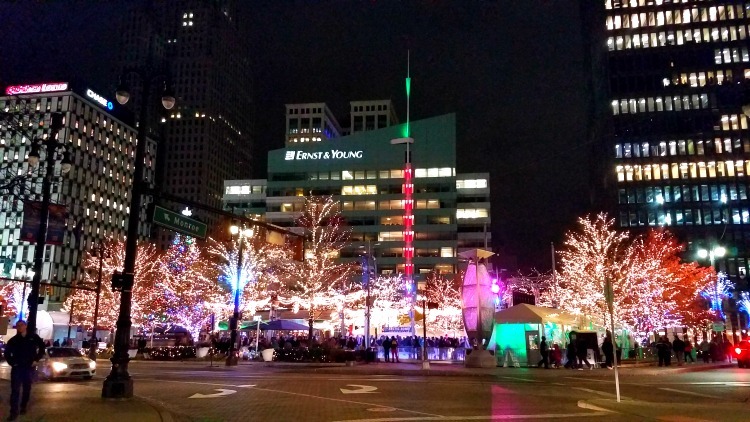 Since this visit happened to fall during the holidays, I was delighted to find the downtown area lit up. The twinkling lights, a giant decorated tree, a large menorah, an ice skating rink, and other fun events worked in bringing the community and visitors together. 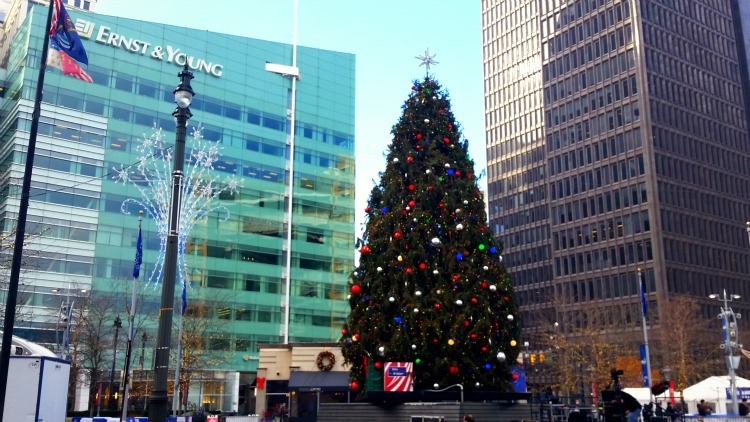 Although, even without the holiday season underway, the downtown area still had a lot to offer. Artist shops, a boutique patisserie, and large community art projects – each which filled me up in a slightly different way. For me, a day spent walking around downtown Detroit was fun and refreshing. Detroit during the holidays. Photo by Mary Moore / Retro TravelingMom. Sometimes, a clean and quiet room with a bed to rest in is all I need to refuel. 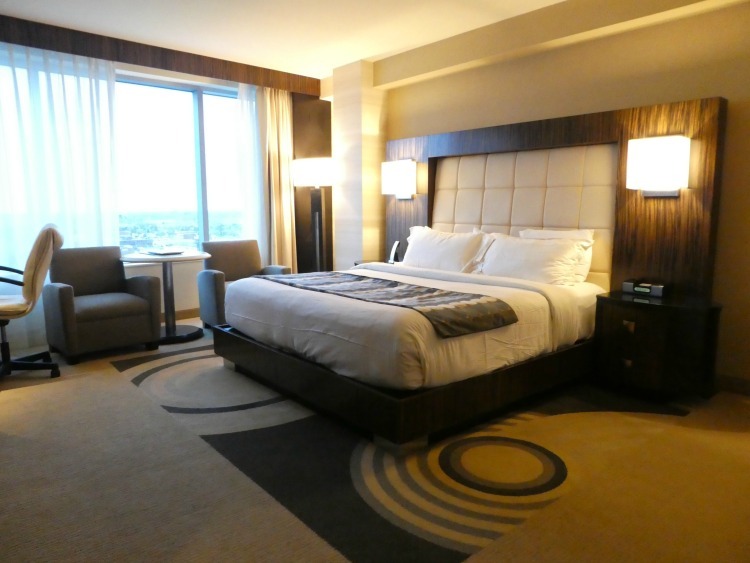 As I walked into my King room at the MotorCity Casino Hotel, the feeling of calm quickly surrounded me. 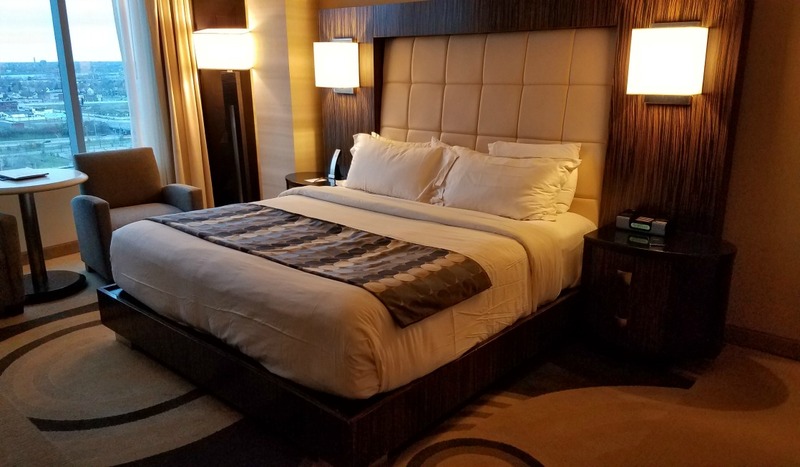 The room was well-equipped with everything that I needed – a large clean bed, a separate tub and shower, a mini bar area with Starbucks coffee, a lovely view out my window of Detroit, and mind-clearing silence. I was totally tempted to wear the white hotel monogrammed robe hanging in the bathroom, call room service, and spend the rest of my weekend in bed. However, I instead decided to immerse myself in the experience and dine at the top floor 4-diamond dining restaurant located inside the MotorCity Casino Hotel. Within the MotorCity Casino Hotel is a AAA 4-diamond restaurant with a jaw-dropping view of Detroit. I unwound as I sipped a few drinks and enjoyed being pampered with a meal fit for a queen. My freshly prepared meal was crafted by a team of hand-picked culinary experts. And I soaked in the lovely view of the restaurant space overlooking a sparkling city at night. 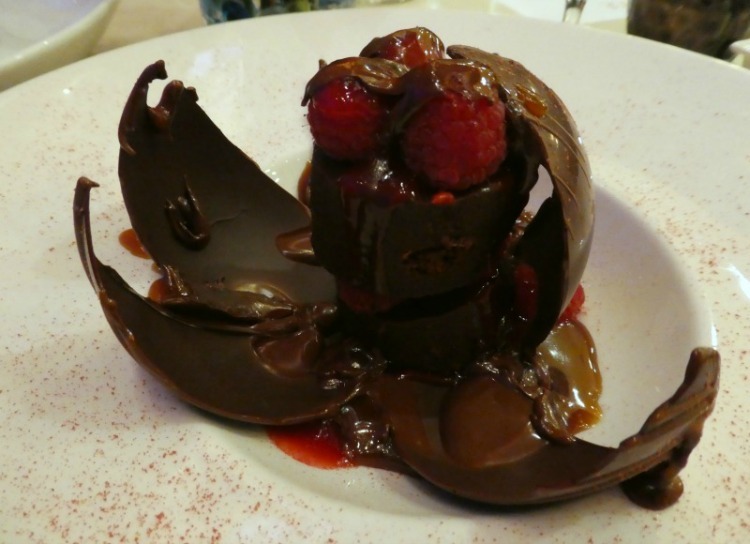 Dessert at Iridescence, located within the MotorCity Casino Hotel. Photo by Mary Moore / Retro TravelingMom. When I need a jump start on creativity, Detroit always has my back. The growing art culture in this city is evident on the sides of buildings in beautiful and vibrant murals and in community fed projects. 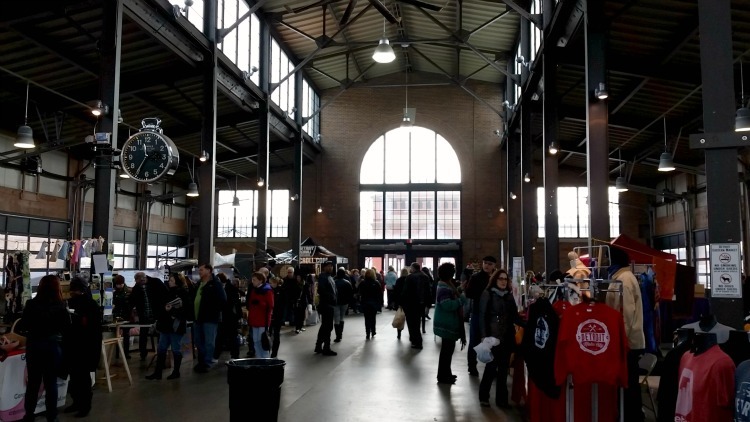 And while there doesn’t seem to be a lack of supply all around the city, a few places that always seem to fill my cup with art are the Eastern Market and the Lincoln Street Art Park. Street Art in Downtown Detroit. Photo by Mary Moore / Retro TravelingMom. The Eastern Markets are a collection of vendors assembled within different sheds, but all within walking distance from each other. Each shed has something different to offer, such as produce, baked goods, meats, artist collections, micro-herbs, and more. I always find it easy to spend the day simply wandering around the Eastern Markets. Since the markets mimic that of a large farmers market, the offerings tend to change with the seasons. Plus, while you’re here, be sure to keep an eye out of public art and wall murals. Eastern Markets in Detroit. Photo by Mary Moore / Retro TravelingMom. Since I love almost all things retro, it is no surprise that the Motown Music Museum would be hot on my list. This popular and growing spot is a must-see for history fans and music lovers alike. 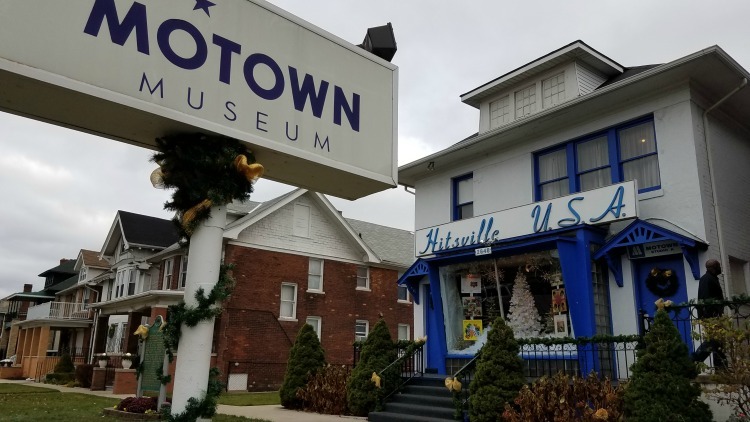 If you’d like to step inside the home of Motown, hear the stories, and gaze upon the remaining artifacts of an important piece of history, be sure to book your guided tour well in advance of your trip. This hot spot tends to book up quickly and only those with tickets can enter the museum. Motown Museum in Detroit, Michigan. Photo by Mary Moore / Retro TravelingMom. Traveling with the family? Check out this list of Free Family Things to Do in Detroit.